Mr. Sonam Choephel Shosur, the chief Election Commissioner accompanied by Additional Election Commissioners Ven. Geshe Tenpa Tashi and Mr. Tenzin Choephel at the press conference, 10 June 2015. DHARAMSHALA: The Election Commission of the Central Tibetan Administration today announced the dates for the preliminary and final election of Sikyong of the 15th Kashag and members of the 16th Tibetan Parliament-in-Exile. “The preliminary election for Sikyong and members of the 16th Tibetan Parliament is slated for 18 October 2015. The final election would be held on 20 March 2016,” Mr. Sonam Choephel Shosur, the Chief Election Commissioner, said. The Election Commissioner is accompanied by the two Additional Election Commissioners appointed recently by the standing committee of the Tibetan parliament in lieu of the upcoming elections. The election commission also announced the new rules regarding campaign expenses and activities of the candidates. 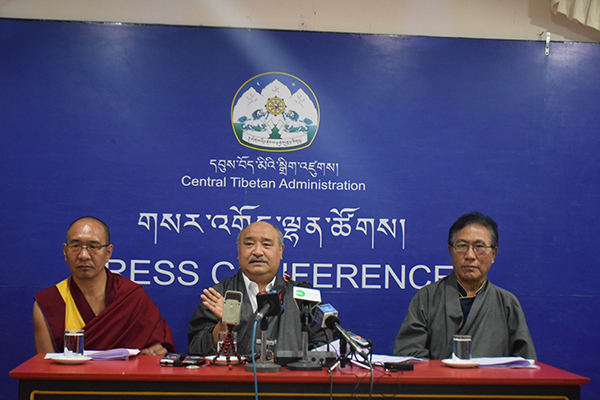 “The total campaign expense for a Sikyong candidate should not exceed INR 8 Lacs and the campaign expense for a candidate for the Tibetan Parliament-in-Exile should not exceed INR 3 Lacs,” the Election Commissioner said, adding that all campaign activities should cease two days before the final Election Day. The election commission urged the candidates to submit their names and details to their local election commission before announcing their candidacy. They also urged the candidates to refrain from excessive campaigning in sensitive areas such as Nepal where the local people are recovering from a severe natural tragedy. The 2016 general election will elect the fourth directly elected Sikyong (earlier Kalon Tripa) and the 16th Tibetan Parliament-in-Exile. The 16th Tibetan Parliament-in-Exile would be composed of 45 members with ten representatives each from the three traditional Tibetan provinces; two representatives each from the four major schools of Tibetan Buddhism and Bon religion, two representatives from North and South America, two representatives from Europe and Africa, and one representative from Australia and Asia (excluding India, Nepal and Bhutan). For a complete detail of the announcement, click here.